Vienna Zoo, one of the best in the world. Tiergarten Schönbrunn (literally means ‘Schönbrunn Zoo’), or ‘Vienna Zoo’. The zoo is located within the grounds of the UNESCO world heritage site at Schonbrunn Palace and is the world’s oldest zoo, established way back in 1752! It was constructed under the order of the Holy Roman Emperor Francis 1st. The zoo was centred around a pavilion where the Hapsburg Royals would have breakfast amongst the menagerie of animals. The animals were housed in 13 enclosures that were arranged around the centre pavilion to represent 13 slices of cake. A small zoo had existed at Schönbrunn since 1540 but was only opened to the public for the first time in 1779. Holy Roman Emperor Joseph II sent expeditions to Africa and the America’s to secure new species for the zoo. At the onset of World War 1, the zoo had 3,500 animals. A lack of food during World War 1 meant this shrunk to 900 animals by the end of the War. The zoo suffered even more so during World War 2 when Austria was aligned with Germany. Many buildings were destroyed and the zoo was on the brink of collapse with only 400 animals remaining. The zoo was slowly renovated and sold into private ownership in the early 1990’s. The new owners did their best to bring in animals that were rare and interesting such as Koalas and giant Pandas. The Schönbrunn Zoo of today has positioned itself at the forefront of animal conservation practices. The Schonbrunn Zoo is the most successful zoo outside of China when it comes to breeding Pandas. 3 Giant Panda’s have been bred at Schonbrunn Zoo. The first panda to be born was in 2007. This was the first Panda to be conceived naturally in Europe. The zoo currently has 8500 animals that represent more than 700 species that live throughout the complex. The most popular animals are the Giant Panda’s and viewing room to watch the Panda eat, sleep and play are at a premium. All of us just stood in complete wonder as we watched them eat and play in their enclosure. It was fantastic to see these amazing creatures happily relaxing and eating away on their bamboo! I could have stayed all day in that one spot watching them! We visited the zoo while staying in Vienna in the summer of 2015. We accessed the zoo via public transport from the city. This was a really easy way to get out to the Zoo and we also were able to look at the Palace and its gardens while we were there. The train takes you around 20-30 minutes to get to Schonbrunn depending on where in Vienna you are staying. We found the zoo a great choice when visiting Vienna with kids. Travelling with kids can be tricky at times but a good zoo like Wein Zoo can bring a smile to the kid’s faces quickly. Our impressions were that it is a great zoo to visit well set out with first rate enclosures for viewing the animals that are housed here. Our girls particularly loved the giant panda’s and we spent 10-15 minutes watching them play and wrestle. The Giant Panda was the highlight for all of us as it was our families first Giant Panda sighting. The koalas were a favourite with our kids even though we are Australian and we can spot Koala’s in tree’s around our area at home. The elephant enclosure is amazing with an indoor and outdoor section. The Vienna hop on hop off bus will take you to the zoo. Explore the beautiful buildings and gardens of Vienna at your own pace from on board the city’s open-top double-decker hop-on-hop-off sightseeing bus, and learn how the Austrian capital developed from its early Celtic and Roman settlements to become the largest city in Austria. For booking and ticket prices click HERE. The elephants wander into the indoor enclosure at feeding time. Inside the viewing, area there is setting to sit and watch these magnificent animals. The zoo has lots of small kids playgrounds dotted around it, that will break up the animal watching. Look out for the animal sculptures that you can get some photo’s of the kids on. Another of the enclosures we enjoyed was the bird aviary. It was very tropical, with so many different plants and animals in there. The only thing is that the stairs may be an issue for any families with a pram and the bat cave if you are easily freaked out! There are many for and against zoos for kids. Our kids love the zoo. The main entrance “Hietzing” is close to the U4 underground station Hietzing. The zoo is easily reachable from anywhere you decide to stay in Vienna. 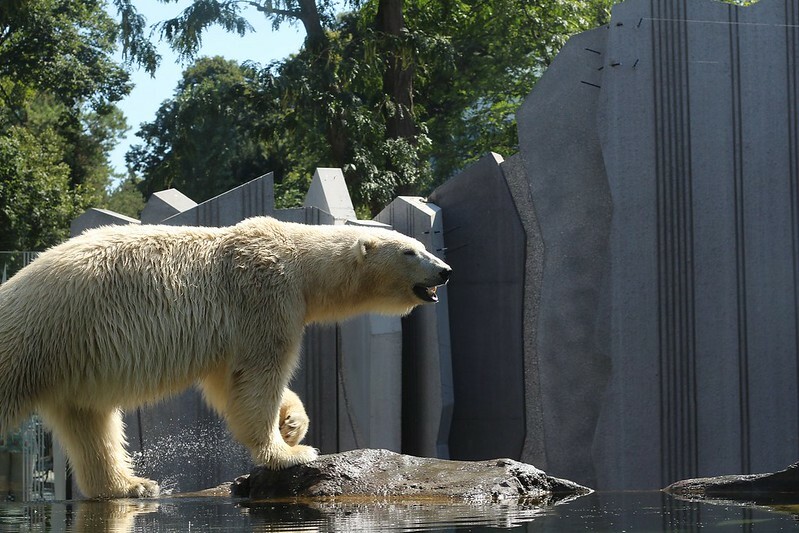 The zoo features numerous recreations of habitats from all over the world and is home to more than 4,000 animals, including elephants, koalas, giraffes, and giant pandas. For the latest prices and tickets click HERE. The zoo is open daily from 9 a.m. – 365 days a year, also in winter and on public holidays. Closing times vary between 4.30 p.m. and 6.30 p.m depending on the season. Please note that the Palace Gardens (Schlosspark) are closed shortly afterwards. Ticket office closing time and last entry time is 30 minutes before the end of visiting time. All the usual facilities such as toilets, food and drink stands, souvenir shops and a cafe is available. Plan a whole day trip at Schönbrunn. You can visit the Palace, the Zoo and the gardens. It’s an amazing attraction for the whole family and one that our family won’t forget in a hurry. The Vienna Zoo pandas were amazing. The kids were talking about our day at the zoo for weeks after the visit. If you are staying in Vienna we recommend that you spend a whole day at Schonbrunn to see the Palace and the Zoo. We at Wyld Family Travel don’t buy into the whole ethical things about zoos being good or bad. We understand some people don’t like zoos and we respect that opinion but please respect that we like visiting well maintained respected zoos. I love that there is a palace and gardens you can tour. That would sell me on visiting. Even a bad zoo is a good zoo. There’s just something about being able to observe animals. I once went to a pretty sketchy zoo in Nigeria and still had a good time. We too love seeing animals, though preferably in the wild, however as this is not possible always we settle for wildlife sanctuaries and zoo’s. Mark, I’ve just spent a heap of time back in Belgium and France picking up more of the war history and how much it impacted the areas, the people, the towns etc. It was therefore very interesting to read that the Zoo was also impacted by WWI and how they have picked themselves back up from nothing to create such an amazing place today. I love the fact that our national koala is there too. And he (she) looks pretty darn happy. The Giant Panda is indeed very cute. Are there any interactive zones like how they have in Singapore zoo – where the kids can feed and have fun with animals? We have been there and it was nice to see it… our favorite still Berlin Zoo mainly the area where all the birds are!!! Wow–I had no idea this was the oldest zoo in the world. Now I definitely have it on my list–would love to visit some day. Good to hear that you think the exhibits and enclosures are well done and suitable for the animals–something I think is so important! Looks fantastic! Now I am feeling horrible for taking Vienna off of our list of places we were going to this summer. Maybe another time!!! I’ve never heard of a zoo with a palace and gardens as part of it. That alone, would sell me on going. So unique! You know what? I didn’t even know Vienna had a zoo but it this place looks pretty incredible! I can totally understand why the pandas would be one of the most popular parts as well. Those animals are incredible and it’s good to know they’re conserving that beautiful species of animal. I would have went just for the palace and gardens! This is a really neat place! I’ve never been a fan of zoos but have heard good things about this one. Love that there’s a palace and gardens too! Were there any interactive areas, and snakes? I don’t remember if you mentioned those slithering reptiles.